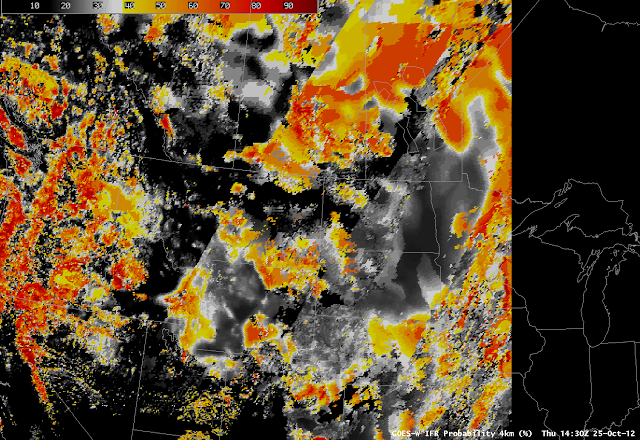 Both the nighttime visible image from the Suomi/NPP VIIRS instrument (which uses moonlight as an illumination source) and the traditional brightness temperature difference product suggest the presence of water-based clouds over eastern Montana and northwest North Dakota on the morning of 31 October 2012. However, there are no reports in Montana of IFR conditions. 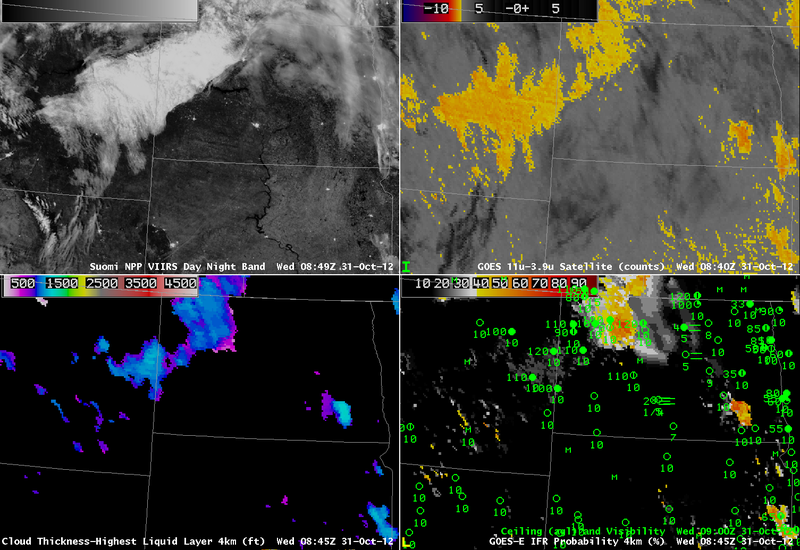 GOES-R IFR Probabilities overlapping the cloud deck are very low. It is likely that this cloud feature is elevated stratus, and that saturation is not occuring in the lowest levels of the model. Fusing both model and satellite data yields a product that can be greater than the sum of the two. Note, however, the IFR conditions that do exist in Bismarck, where IFR probabilities are very low and satellite information shows no fog signal. This is likely very small scale river fog in the Missouri River Valley that is both too small to be resolved in the model or detected by the satellite. In addition, very thin cirrus is interfering with the detection of low-level water clouds in much of central North Dakota. This entry was posted in Cloud Thickness, Day/Night Band, Northern Plains, Suomi/NPP on October 31, 2012 by Scott Lindstrom. The marine stratus over the mid-atlantic on Oct 25th (Link) has continued to spread southwestward into North Carolina, and higher values in the IFR probability fields continue to overlap nicely with observed IFR conditions in the Piedmont of North Carolina. The image above at 0800 UTC, and below at 1100 UTC, show deteriorating flight conditions as the high probabilities ooze southwestward. Note that the traditional brightness temperature difference field does show a signature of the cirrus outflow from Hurricane Sandy off the coast of the Carolinas, in the extreme southeast part of the images, both at 0800 UTC and 1100 UTC. By 1600 UTC, the cirrus canopy from Sandy has overspread most of eastern North Carolina. This makes satellite data less useful in computing IFR probabilities, and Model Data comparatively more important, and the character of the IFR probability field does change, with a smoother field overall. At 1600 UTC the probabilities have decreased; the temporal evolution of the field (not shown) is still giving important information, especially in concert with the surface visibility/ceiling observations. The decrease in probabilities is gradual as the Sun slowly works to warm the boundary layer. This entry was posted in Cloud Thickness, Mid-Atlantic, Multiple Cloud Layers on October 26, 2012 by Scott Lindstrom. Detection of fog and low stratus in Alaska present some unique challenges related both to the very low sun angle that is common there, and the large GOES-West pixel size. Nevertheless, the fused product does give important information in a state where small planes are ubiquitous for transport between towns. The loop above shows the development of IFR conditions within the Yukon River valley in east-central Alaska; note the reduction in visibility that occurs at Fort Yukon (and only there) as the IFR probabilities increase. IFR probabilities also increase in the Yukon Territory of Canada. The lack of surface observations there highlights another challenge in Alaska: Verification of predictions of IFR conditions. This entry was posted in Alaska, Terrain on October 25, 2012 by Scott Lindstrom. Marine Stratus has moved inland over Maryland and surrounding states overnight, and the GOES-R IFR probabilities capture the visibility restrictions that have accompanied it. The imagery above includes the traditional brightness temperature difference fields computed from Suomi/NPP (horizontal resolution: 1 km at nadir) and from GOES (nominal horizontal resolution: 4 km at nadir). The distinct leading edge of the marine layer is readily apparent in the Susquehanna River Valley. Note, however, that the strong returns over the Hudson River Valley do not correlate well with reduced visibilities. The GOES-R IFR probabilities do a good job depicting the marine layer in the Susquehanna River Valley (shown by the relatively high probabilities), but return much lower probabilities over the Hudson River Valley where surface observations indicate hazardous low clouds are not present. Again, this is a benefit of using a fused product. The temporal resolution of GOES-R IFR products allow for continuous monitoring of an evolving situation, making up for the relatively poor horizontal resolution (compared to polar orbiting platforms like Suomi/NPP or Terra/Aqua). The IFR probability field neatly captured the relentless inland push of the marine stratus air, and as the probabilities increase at locations, IFR conditions become more likely. The loop above includes a Day/Night band image that is reproduced below. The day/night band, even in low lunar light cases, can distinguish between clear sky and clouds over ocean. Over land, however, the interpretation is complicated by city lights shining through clouds. Nevertheless, the cloudy region can be discerned over parts of eastern Pennsylvania and Maryland, where the light signal is more diffuse. This entry was posted in Cloud Thickness, Day/Night Band, Mid-Atlantic, Suomi/NPP on October 25, 2012 by Scott Lindstrom. Dewpoints in the low 60s (Fahrenheit) surging into the upper Midwest in late October heighten the chances of fog, and the GOES-R Fog/Low Stratus product did a commendable job of showing where the fog might be occurring. The loop above shows the IFR Probabilities over Wisconsin, Iowa and Minnesota as well as visibility/ceiling observations. The northwest-southeast edge of higher probabilities over southern to west-central Wisconsin at 0100 UTC matches the observations well: IFR conditions prevail in regions north and east of that line. Note also, at 0400 UTC, the skinny region of enhanced IFR probabilities that hugs the western shore of Lake Michigan. Lake Michigan lake surface temperatures are in the low 40s, so dewpoints above 50 will result in a dense advection fog. Heightened probabilities continue at 0800 UTC over northern and eastern Wisconsin, in agreement with observations. The Brightness temperature difference field historically has been used to diagnose the presence of low clouds, and the animation above shows the importance of using fused products — that include some kind of influence from surface observations as occurs in the Rapid Refresh — to clarify exactly where the low clouds that obstruct visibility are common. Consider the field at 0100 UTC. The IFR probability delineates between higher visibility over southern/western Wisconsin and lower visibilities north and east. No such delineation occurs in the tradiational product because the brightness temperature difference alone cannot indicate the ceiling. 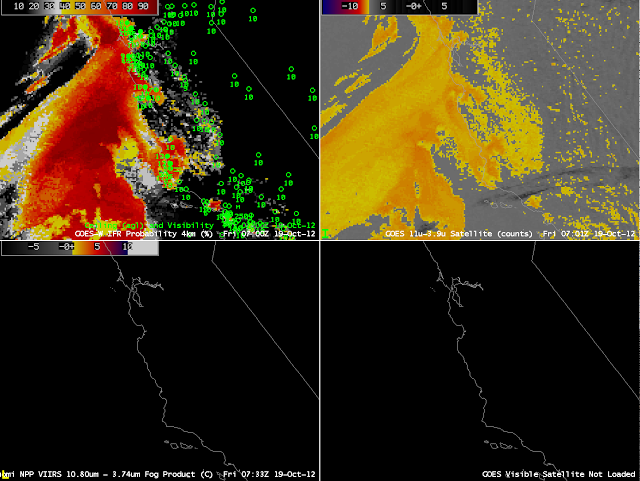 MODIS data is also used to create IFR Probability fields, and the 0417 UTC imagery is shown below. MODIS-based GOES-R IFR Probabilities, 0417 UTC 24 October. This entry was posted in MODIS, Multiple Cloud Layers, Wisconsin on October 24, 2012 by Scott Lindstrom. 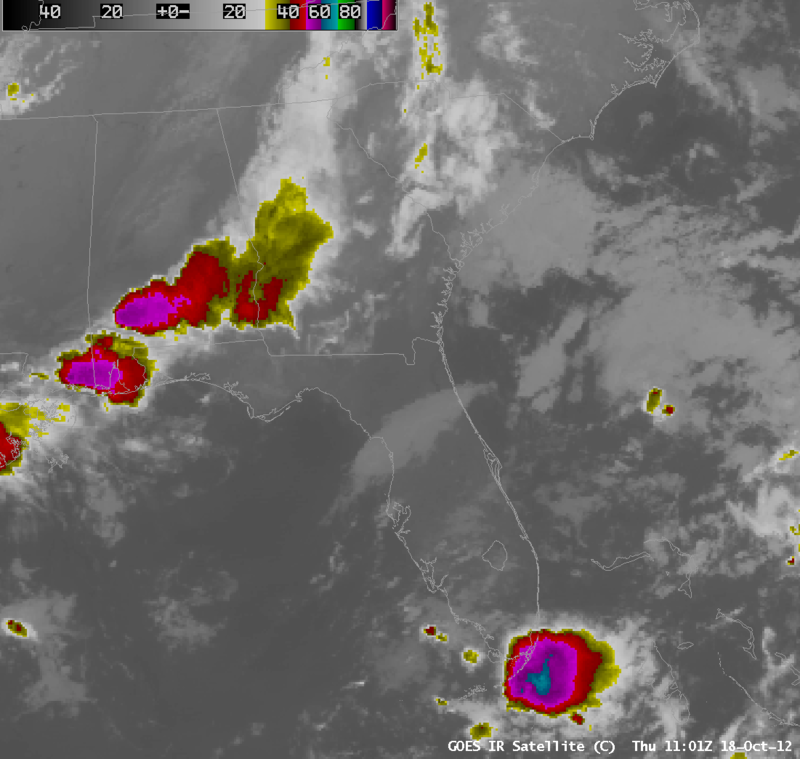 Steve Davis (NWS at Sullivan/MKX) has written a blog post on Fog development over southern Louisiana that is worth a look! Link! This entry was posted in Deep South, Multiple Cloud Layers on October 24, 2012 by Scott Lindstrom. Fog/Low Stratus over the Upper Midwest U.S. 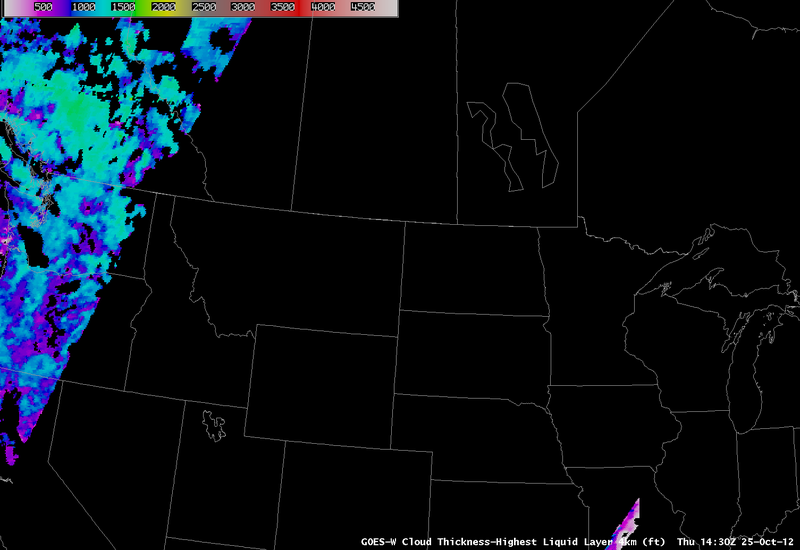 The GOES-R IFR probabilities are useful when monitoring the formation of fog and/or low stratus (FLS) clouds. In this case over the Upper Midwest U.S. FLS started forming over eastern South Dakota and quickly spread to adjacent states eventually becoming widespread over most of the Upper Midwest. Surface observations of IFR conditions correlate very well to the areas of high IFR probabilities denoted by the dark orange to red colors. In the animation above the GOES-R IFR probabilities track the formation of the FLS with high confidence, evidenced by the relatively high IFR probabilities. The traditionally-used 3.9-11 micron BTD product also detects the FLS, but has difficulty detecting the spatial extent of the hazardous areas of the cloud deck. During the initial formation before 10Z Surface observations over Iowa and S. Minnesota indicate that elevated clouds are present, but they do not meet the IFR criteria for surface visibility (< 3 miles) and/or cloud ceiling (<1000 ft) until after a cluster of showers and thunderstorms passes through. This cluster of showers and storms can be seen in the 3.9-11 micron BTD as the gray and black circular area moving east over Iowa. In these types of situations the satellite only approach does not provide any information on what's going on near the surface because the satellite can only view the top most cloud layer. Using a blended approach merging satellite information with modeled forecast data from the Rapid Refresh model the IFR probabilities can still provide useful information on the presence of hazardous low cloud conditions even when multiple cloud layers are present. The GOES-R LIFR probabilities can be useful for gaining confidence on whether the FLS is near the surface or if the cloud deck is elevated. Areas of relatively higher IFR and LIFR probabilities usually correlate well to lower surface visibility observations while areas of relatively high IFR probabilities and low LIFR probabilities usually correspond to higher surface visibilities but low cloud ceilings. When the Sun rises, reflected solar radiation makes using the traditional BTD very difficult. The GOES-R IFR probabilities are available both night and day so users will be able to use the products through sunrise and sunset with confidence. During the day the visible satellite image shows the smooth FLS deck over western Nebraska and what appears to be some cumuliform clouds over eastern Nebraska. 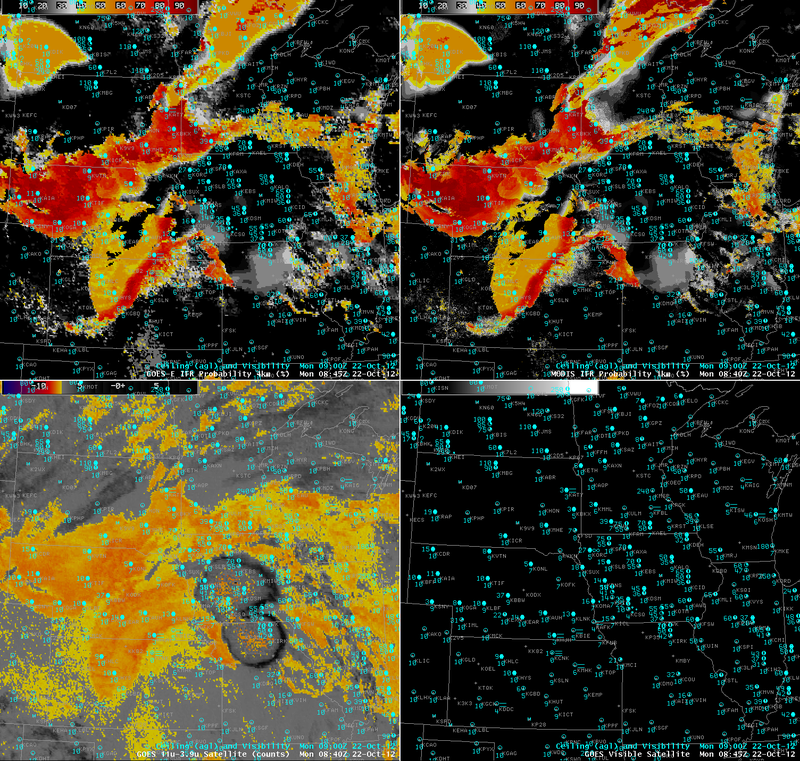 Surface observations show IFR conditions are present over most of Nebraska and again correlate very well with high IFR probabilities, even in the presence of the overlaying cumuliform cloud deck. The GOES data is available at a high temporal resolution, but only has a spatial resolution of 4km. Applying the GOES-R FLS products to MODIS allows the use of a much high spatial resolution (1km) dataset. The downfall is that since MODIS is on a polar orbiting satellite it is only available a few times per day. However, the higher spatial resolution allows the user to see much more detail than can be obtained using GOES data. This entry was posted in Midwest, MODIS, Multiple Cloud Layers, Northern Plains on October 22, 2012 by Scott Lindstrom. 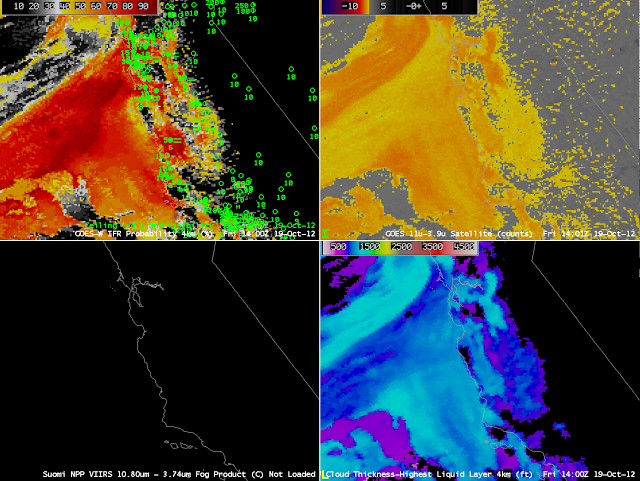 GOES-R IFR Probabilities can be used to evaluate and monitor the evolution of marine stratus as it (nightly) moves inland from the Pacific Ocean to adjacent land over California, as well as the evolution of fog and low clouds/haze over the central Valley of California. At 0200 UTC — near sunset — as shown above, IFR conditions are diagnosed from fused satellite and model data to be most likely offshore, despite a brightness temperature difference signal in California’s Central Valley, where airports are not reporting IFR conditions. 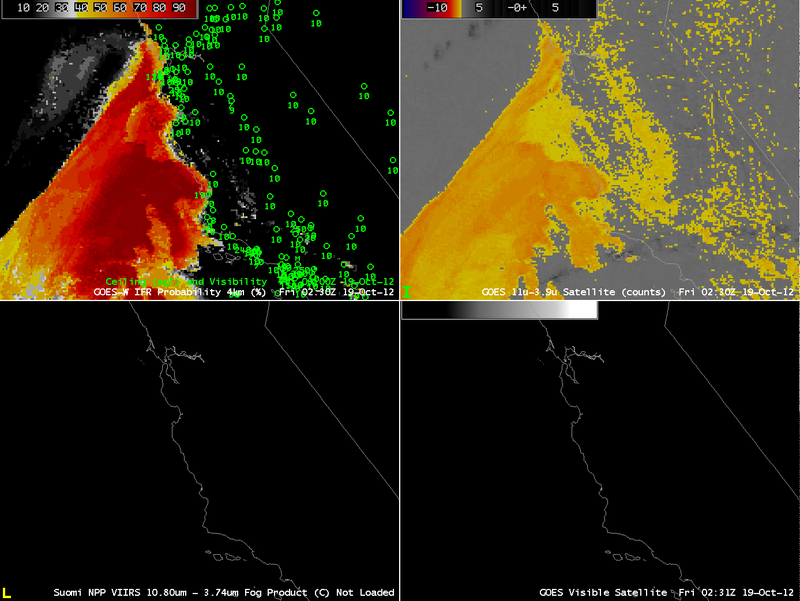 In other words, the GOES-R IFR algorithm is correctly suppressing the satellite signal inland. 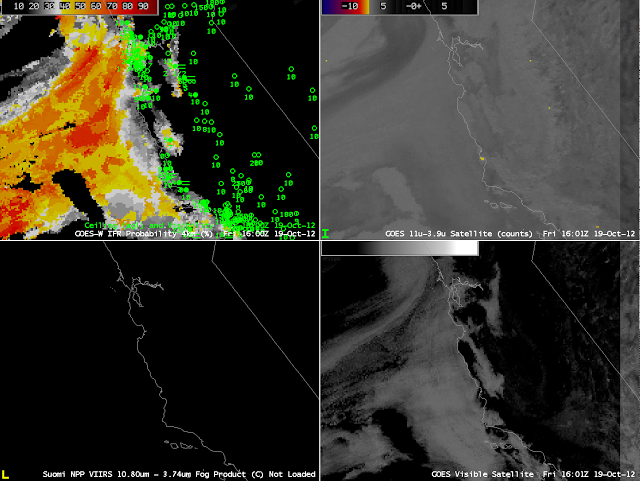 By 0700 UTC, ceilings and visibilities in the Salinas and Central Valleys have started to lower as IFR probabilities decrease. 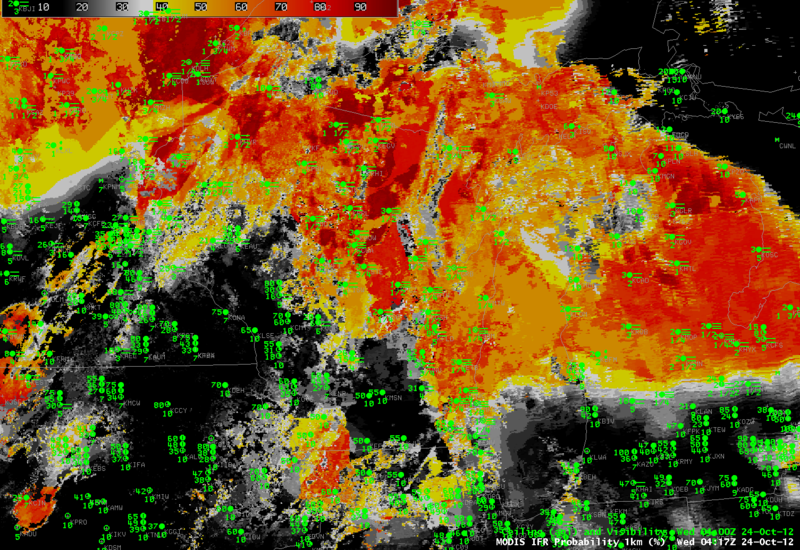 Ceilings and visibilities decrease further by 0900 UTC, as shown above. Reasons for the difficulty in accurately diagnosing the probabilities over the Salinas Valley can be inferred from the figure above, which includes a (high-resolution) Suomi/NPP Brightness temperature difference plot that has a strong signal all along the Salinas Valley; such a strong signal is not so evident in the GOES brightness temperature difference field that uses data at coarser resolution. It’s important that the satellite signal is strong in this fused product because the valley is not well-resolved in the Rapid Refresh Model. When GOES-R is operational, infrared resolution will be 2 km — in between that of Suomi/NPP (1 km) and GOES (4 km). The 1400 UTC image includes cloud thickness as diagnosed by the GOES-R algorithm. Cloud thickness is well correlated with dissipation time for radiation fog — but not necessarily for advection fog. Nevertheless, the regions diagnosed with thickest fog above continue to show fog in the visible imagery below, from 1600 UTC. 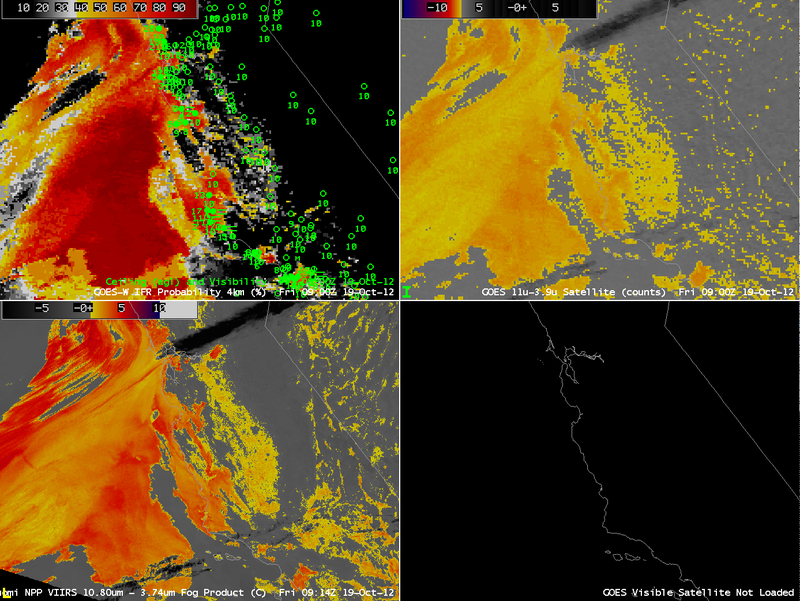 This entry was posted in California, Cloud Thickness, Suomi/NPP on October 19, 2012 by Scott Lindstrom.